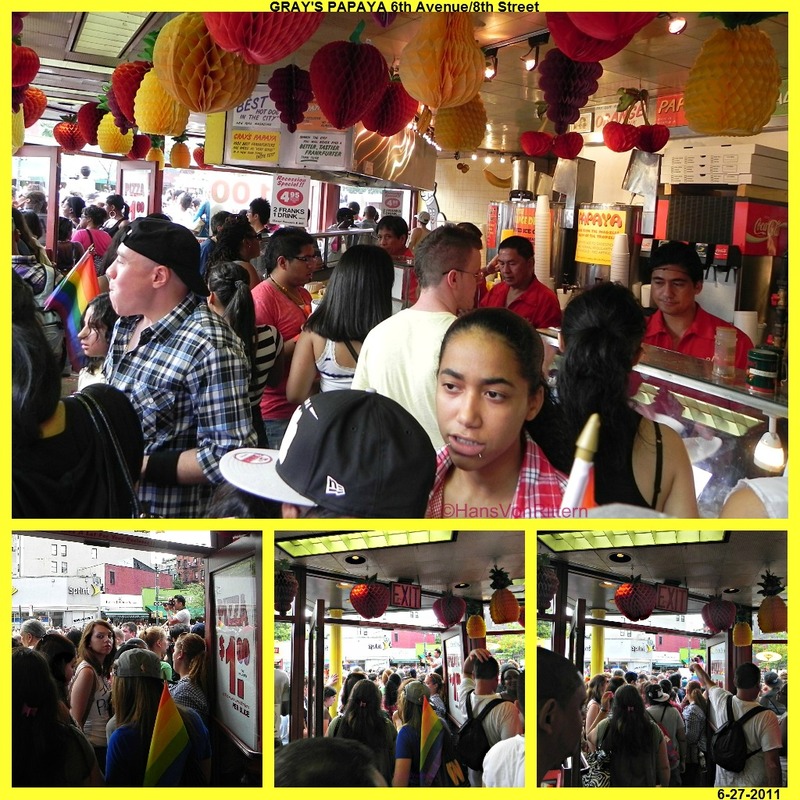 Photo of the day: MOURNING THE GAY PRIDE DAY’S GRAY’S PAPAYA ~ What on earth will Gay Pride be without the wonderfully bright yellow Gray’s Papaya on the corner of 6th Avenue and 8th Street, the epicenter of the Gay Pride day parade?!?! For anyone that has ever followed the maddening crowd of the parade on the sidewalk as a spectacular spectator, knows the tightest bottleneck of the parade is when you come to the main intersection of 8th/6th. It is where the large Fifth Avenue sized fabulous parade has been squeezed onto narrow 8th Street and now pours onto the big 6th Avenue intersection again leading it to the ceremonial entrance to gay history’s Christopher Street. The police have therefore cordoned off any chance of you crossing the street within blocks of this big intersection. It does give the parade marchers the space to twirl and show-off before shashaying onto Christopher Street – it’s a divine madhouse! But the one chance you had to make it around the corner as a spectator was to cut through Gray’s Papaya’s open walk-through corner, and by the thousands we did. It was a quick mini party stop for you to grab that desperately needed cold juice and those wonderfully tasty hot dogs and $1.00 slices of pizza, it was party on the go! The (sadly now) iconic paper fold out fruit decorations hanging from the ceiling made it feel like you were stopping by a madhouse Carmen Miranda fruit stand! With the perfect flow through traffic pattern open corner set-up, it was the absolute ideal guaranteed chance at grabbing that badly needed drink and some nourishment as you tried to make it further along the parade route. That super staff never missed a Latin beat, those dogs and slices were dished out as fast as we ordered them, those Papayans were one of the true martyrs of the parade! I always admired how they kept there cool while others were like “ay caramba!”. Nicholas Gray, the proprietor could not afford to have his monthly rent increased outrageously from $30,000 to $50,000 a month, therefore he was forced to close. Yes there is Nathan’s in Coney Island and it has wonderful history, but most New Yawkers are not willing to pack a suitcase to travel to the outer reaches of Brooklyn for a dawg. So, Gay Pride and the largest Halloween Parade in the world and especially late night party goers all are going to miss you terribly, a very strategically placed Gray’s Papaya. Adios mis amigos, adios 😦 . . . This entry was posted on January 10, 2014 by newyorkcityinthewitofaneye. It was filed under DAILY PHOTOS WITH STORIES OF NEW YORK CITY and was tagged with $1. pizza, 8th Street corner 6th Avenue, Christopher street, Gay Pride, Gay Pride day, Gay Pride Day parade New York, Gay Pride New York City, Gay Pride parade route, Gray's Papaya, Gray's Papaya closed, Gray's Papaya hot dogs, Gray's Papaya rent increase, Greenwich Village, Hans Von Rittern, New York City, New York Halloween parade, New York photo, Nicholas Gray, Photo of the day, photography.